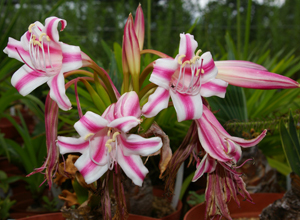 Scientists at the University of Copenhagen have previously documented that substances from the South African plant species Crinum and Cyrtanthus – akin to snowdrops and daffodils – have an effect on the mechanisms in the brain that are involved in depression. This research has now yielded further results, since a team based at the Faculty of Health and Medical Sciences has recently shown how several South African flowers contain plant compounds whose characteristics enable them to negotiate the defensive blood-brain barrier that is a key challenge in all new drug development. "Several of our plant compounds can probably be smuggled past the brain's effective barrier proteins. We examined various compounds for their influence on the transporter proteins in the brain. This study was made in a genetically-modified cell model of the blood-brain barrier that contains high levels of the transporter P-glycoprotein. Our results are promising, and several of the chemical compounds studied should therefore be tested further, as candidates for long-term drug development," says Associate Professor Birger Brodin. "The biggest challenge in medical treatment of diseases of the brain is that the drug cannot pass through the blood-brain barrier. The blood vessels of the brain are impenetrable for most compounds, one reason being the very active transporter proteins. You could say that the proteins pump the drugs out of the cells just as quickly as they are pumped in. So it is of great interest to find compounds that manage to 'trick' this line of defence." "This is the first stage of a lengthy process, so it will take some time before we can determine which of the plant compounds can be used in further drug development," says Birger Brodin. "In my research group, we have had a long-term focus on the body’s barrier tissue – and in recent years particularly the transport of drug compounds across the blood-brain barrier. More than 90 per cent of all potential drugs fail the test by not making it through the barrier, or being pumped out as soon as they do get in. Studies of natural therapies are a valuable source of inspiration, giving us knowledge that can also be used in other contexts," Birger Brodin emphasises. Throughout evolution, plants have developed a number of substances as defences against herbivores and disease. Some of these potent plant compounds can also be used as medical drugs. André Huss Eriksson, a research scientist at Bioneer:FARMA, and Associate Professor Birger Brodin of the Faculty of Health and Medical Sciences, were interested in the ability of plant alkaloids to pass through the blood-brain barrier. They contacted Associate Professor Anna Jäger of the Department of Molecular Drug Research and Associate Professor Nina Rønsted of the Natural History Museum of Denmark. The latter both work with medicinal plants that affect the central nervous system.